I am starting a new "force" to go along with my already completed Darkest Africa figures, this time the dreaded Force Publique...'cos everyone needs a bad guy to face, even the Arab Slavers...!!! 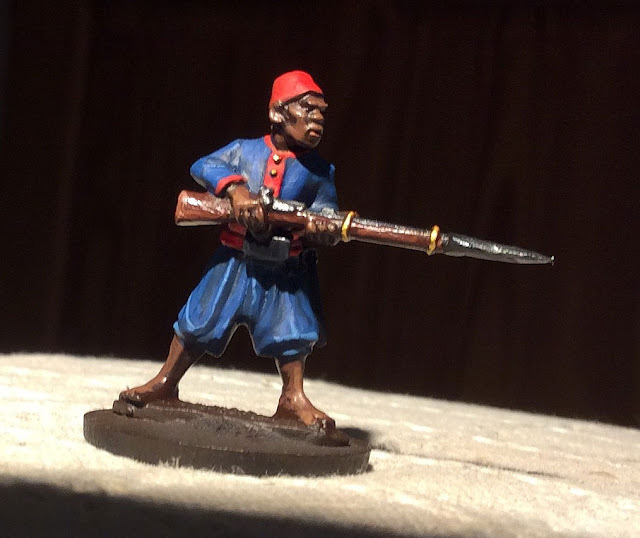 I've learned a lot over the last year painting figures from the 28mm Foundry Darkest Africa range, and my painting style has been evolving slowly from a Base Coat/Dip/Highlight style I've done in the past to a blended style. Anyway, as much for me to remember what i did, as for anyone else, here is my test figure for the Force Publique, with the colour combinations I used. I mix paints as a rule, and blend on the pallet as the mood takes me, rather than paint from the pot. All percentages are approximate...I go with what looks right! That's it for now - hope you find it useful! I will post more at a later date, including information on my basing style, which I've been asked about a few times.